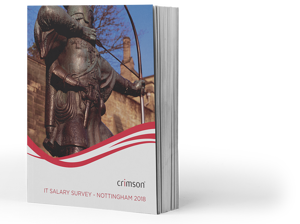 Download Crimson's IT Salary Survey to examine the pay packages for IT department employees in Nottingham and the East Midlands in 2018. Are you paying above the market rate for your permanent employees in your IT team? Do you struggle to retain skilled staff? How does your salary match-up to your peers’? Download this FREE report to compare your company’s salary bands to those of other local IT teams. The data in this survey is based on extensive market research, a wide network of clients and contacts, and expert knowledge from the specialist consultants in Crimson’s IT recruitment agency.